This dragon's scales are a frosty white. Its head is crowned with slender horns, with a thin membrane stretched between them. This is a breakout SoundSet from a Pathfinder Adventure Path SoundPack. Subscribers automatically gain ownership of this SoundSet. This SoundSet was imagined, compiled, designed, created, mixed and finished by Benjamin Loomes of www.syrinscape.com, using samples created by him and also samples from the collaborative Internet database of creative-commons licensed sounds freesound.org. 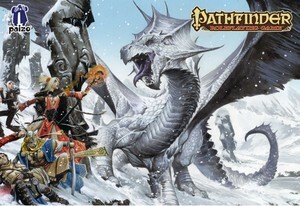 White Dragon (mountainside) SoundSet © 2015 Paizo Inc. Paizo Inc., the Paizo golem logo, Pathfinder, and Pathfinder Adventure Path are trademarks of Paizo Inc. Sounds created under license with Paizo Inc.